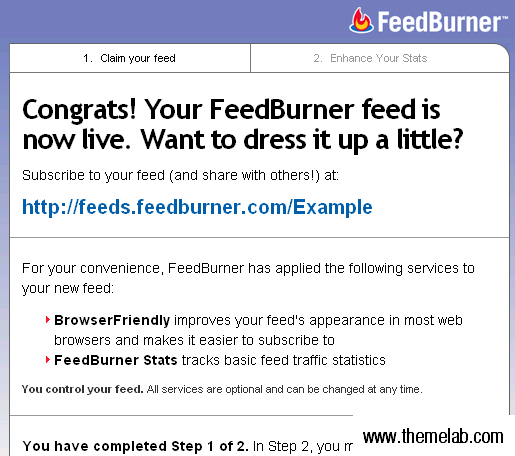 FeedBurner is an essential tool for many bloggers. 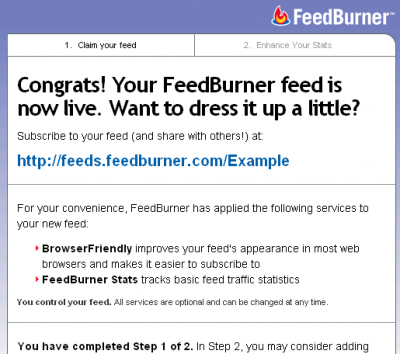 FeedBurner is a tool for managing, syndicating, and promoting your blog feeds. Best of all, it’s a free service. 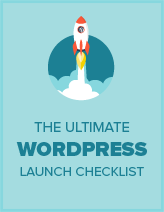 It’s very easy to get started and in this guide, I’ll show you how. To get started, type your blog URL into FeedBurner’s front page. If all is well, it should automatically detect your feed and verify it. 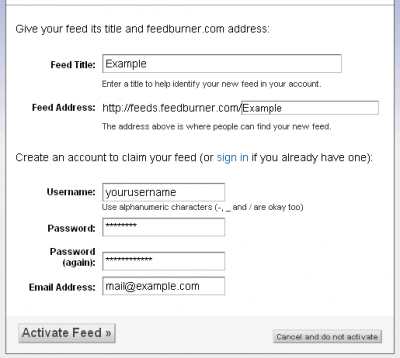 If you don’t already have an account with FeedBurner, it’s easy to sign up. All you need to do is input your e-mail, as well as choose a username and password. Now that you’ve claimed your feed, you should be on a screen which tells you you have completed step 1. 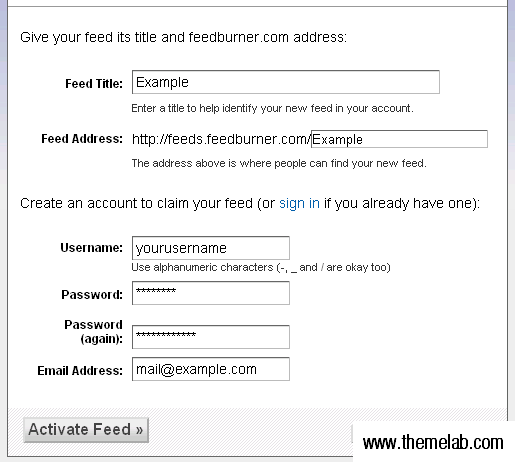 On step 2 of the FeedBurner process, it will prompt you to set up additional free FeedBurner stat tracking. Besides this, you’re all done – unless you want to optimize and publicize your feed more, which will be gone over later. Luckily for self-hosted WordPress users, FeedBurner provides an easy to use plugin to redirect your native WordPress feeds to your brand new FeedBurner-managed feed. It’s called FeedBurner FeedSmith, and you can download it here. Once you have installed and activated the plugin, a new Settings page will be created where you can input your FeedBurner feed URL, as well as a FeedBurner comments feed URL (optional). After saving the settings, your WordPress feed URLs will now redirect to FeedBurner. FeedBurner offers a multitude of free and paid services you can use to optimize, publicize, and monetize your feeds. BrowserFriendly – This will make your FeedBurner page more presentable to all browsers, making it easier for potential readers to subscribe to your feed. FeedFlare – Provides links such as “Add to del.icio.us” and “Digg This” to each of your feed items, so your readers can share content across social networks with ease. Email Subscriptions – Integrate your feed into an e-mail subscription service provided by your choice of either FeedBurner or FeedBlitz. PingShot – Automatically ping several web-based feed reading services such as Technorati, Bloglines, Ping-o-matic, and many more. This is just a small selection of many useful free services provided by FeedBurner. If you don’t already use FeedBurner on your WordPress blogs, you should. It’s super easy to sign up and get started, as I’ve gone over in this guide. Once you build up a good amount of subscribers, you can also use the FeedCount to show off your subscriber count. Thanks for reading, and don’t forget to subscribe to my feed (served by FeedBurner) for more Theme Lab updates. description The request sent by the client was syntactically incorrect (You must provide a feed uri). its been great using feedburner for my blogger blog and now because i have migrated to wordpress i will be continuing using this service here too. @gestroud: That’s a good question that I’m not really sure the answer to. I’m sure a lot of people may unknowingly ping the same services multiple times. I don’t think it’s something to worry about. Someone correct me if I’m wrong. But since that’s nearly 3 years old, I’m not sure what to think about this in relation to FeedBurner. Anyone got any educated guesses? Here’s a question I’ve wondered about concerning Feedburner and WordPress’ ping service. WP offers the ability to ping services of your choice. One (pingomatic) is already included in WP’s Admin Panel options. I think it’s pingomatic.com. Other services can be added. Feedburner offers the same service. Should I disable WP’s ping service to avoid pinging services twice? I’ve put this off so many times, maybe I’ll finally sign up now.